What do you look for when you choose a hotel in Italy? I look for places that are small, unique to the city I’m visiting, simple yet charming, and reasonably priced. I avoid the big chains and international brands in favor of places that are family-owned and offer local character and personal touches. I find the smaller hotels to be welcoming and friendly with great connections to local culture and wonderful service to guests. The first time I traveled to Florence, 20-some years ago, I came across a gem of a small hotel called the Morandi alla Crocetta. I’ve stayed there many times since and it never disappoints – in fact, it’s the only place I stay when I’m in Florence. It has the perfect combination of history, charm, location, service, and price. The hotel is at 50 Via Laura in the section of Florence near the Ospedale degli Innocenti, Church of SS. Annunziata, the Academia (home of the David), and the Archeological Museum. It’s an easy walk to all the major points of interest in Florence, about eight minutes to the Duomo. This is a lively (but not noisy) neighborhood, which is also home to the University of Florence School of Law. During my recent visit, I was able to watch the graduation celebrations as law students and their families marked the completion of degrees (laurea in Italian). What fun it was to witness this event! The Morandi alla Crocetta is a unique property, originally a convent founded by Sister Domenica del Paradiso (what a name!) in the early 16th century, during the era of the Medici. 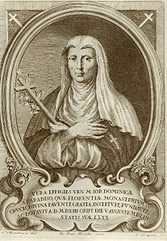 According to the history provided in the hotel literature, Sister Domenica sided with the Medici family in their conflict with the powerful cleric Savonarola, and so the Medici rulers gave her this land on which to build her convent. The convent was called the Convent of the Cross (cross is crocetta in Italian) as all the nuns had a small red cross on their habits. The convent was later enlarged by a Medici princess and connected by an overpass to her palazzo so she could worship at the convent’s small chapel. With time, and a period of religious suppression, the nuns moved away and the convent ceased to exist. Today’s hotel Morandi includes the cloister and gardens from the historic convent. It is a small hotel with two floors (ground and first, with an elevator). The convent’s chapel is no longer accessible, but the former entry to the chapel is perhaps the most interesting room in the hotel - complete with 17th century frescoes and illustrations of the life of Sister Domenica. This room is a bit of a splurge, but definitely worth it. Other rooms range from small (comfortable and economical) singles to large suites, some with private outdoor patios. There are several gracious lounge areas with a variety of books, magazines, and newspapers for browsing. Since I was staying in one of the small single rooms during my most recent visit, I made good use of the comfortable public areas as a place to read and do some writing. The hotel provides a full breakfast in an elegant room overlooking a small courtyard garden. Breakfast includes a basket of cornetti (Italian style croissants) and bread with jam, yogurt, fruit, cereal, juice, coffee, and tea. Also available are eggs, bacon, ham, salami, and cheeses. It’s a great place to meet other travelers and compare experiences over morning coffee. In the evening, the breakfast room transforms into a bar.